Herman Munster (Fred Gwynne) receives word that he has inherited a family estate and the title of Earl of Munster. 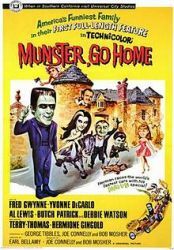 He takes his wife, Lily (Yvonne Carlo), son, Eddie (Butch Patrick) father-in-law, Grandpa (Al Lewis), and niece Marilyn (Debbie Watson) to visit their new home in England. The British side of the family don’t like this one bit, and with the aid of the mysterious Griffin, concoct plans to bump off Herman and allow Freddy Munster (Terry-Thomas) to become heir to the family. Herman finds himself in a local car race, while Lilly and Grandpa try and warn him that he could be killed. It’s the last movie review of this year’s 31 Days of Halloween and I thought I would loop back to where I started with a kid friendly film. I’ve become a big fan of cornball humor and you don’t get much cornier than The Munsters. If you’ve seen even one episode of the TV show that the movie is based on, you pretty much know what you’re going to get here: Jokes about people being frightened at the Munsters' appearance, Herman’s childlike personality causing destruction with his monster body, Grandpa’s untrustworthy magic, etc. The first hour feels like an extended episode, and unfortunately there isn’t enough material to really make it stretch. Once the third act comes around with the car race and Grandpa’s awesome Drag-u-la coffin roadster makes its appearance, things pick-up considerably. It’s here the movie can pull of some larger scale physical humor that the TV show should couldn’t afford to do. It’s a silly movie, but a good Halloween has some goofiness to go with the scares.